Designed for 3D Pro pilots and beginner alike the Vortex range of flybarless systems will amaze you with their performance and features. Its simple and intuitive installation make it the ideal choice for pilots who are venturing for the first time into RC helicopters and flybarless systems. Rotor - The cyclic and collective controls are smooth and precise with a very solid feel and impressive response time. Factory calibrated sensors and Spartan's proprietary piro compensation technology enable your helicopter to remain locked in through piro moves. 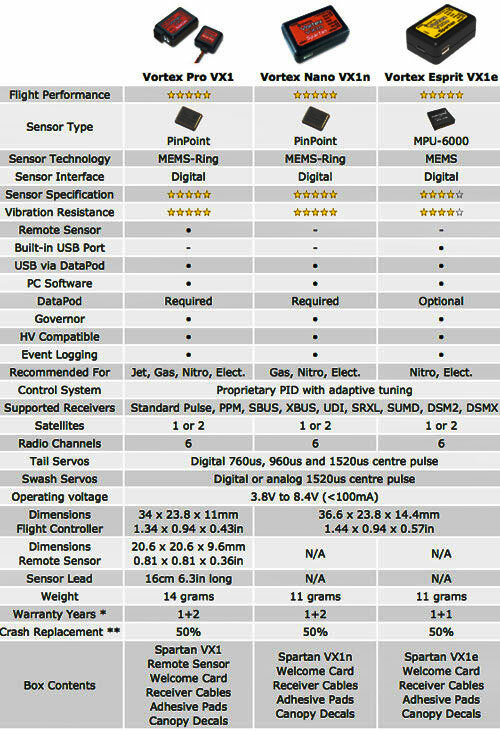 Governor - The built in governor provides Nitro and Electric* modes and support for both magnetic and phase sensors. Cross mixing and look-ahead algorithms ensure that power is delivered in time and not as a result of RPM decay. Receiver - The Vortex is compatible with all radio systems using individual channel connections to the receiver. Additionally it supports single wire connection for most popular protocols and direct connection to 1 or 2 Satellites. Three channels of the radio system can be routed to the Vortex's AUX port to control accessories like lights and glow igniters. 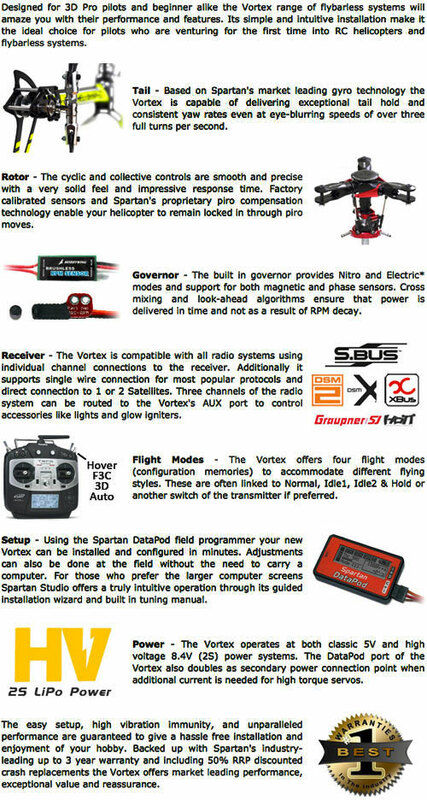 Flight Modes - The Vortex offers four flight modes (configuration memories) to accommodate different flying styles. These are often linked to Normal, Idle1, Idle2 & Hold or another switch of the transmitter if preferred. Setup - Using the Spartan DataPod field programmer your new Vortex can be installed and configured in minutes. Adjustments can also be done at the field without the need to carry a computer. For those who prefer the larger computer screens Spartan Studio offers a truly intuitive operation through its guided installation wizard and built in tuning manual. Power - The Vortex operates at both classic 5V and high voltage 8.4V (2S) power systems. The DataPod port of the Vortex also doubles as secondary power connection point when additional current is needed for high torque servos. The easy setup, high vibration immunity, and unparalleled performance are guaranteed to give a hassle free installation and enjoyment of your hobby. Backed up with Spartan's industry-leading up to 3 year warranty and including 50% RRP discounted crash replacements the Vortex offers market leading performance, exceptional value and reassurance.